Once upon a time there was a girl who could stand against a wall and stretch her left leg in a standing splits. Her leg could go back so far it could touch the wall she was standing up against. That girl had nightmares that that leg would stop being stretchy because she believed it was her USP (and apart from being an identical twin it kind of was.) Yes, that girl was your very own Town Mouse. I inherited double-jointedness from my maternal Grandpa. When I was young I was so stretchy you could have pulled my arms and legs like Stretch Armstrong (or, ah, like someone being drawn and quartered…) and I would probably have bounced back. Alas, I took my flexibility for granted and now that precious left leg can barely extend passed the height of my right knee. 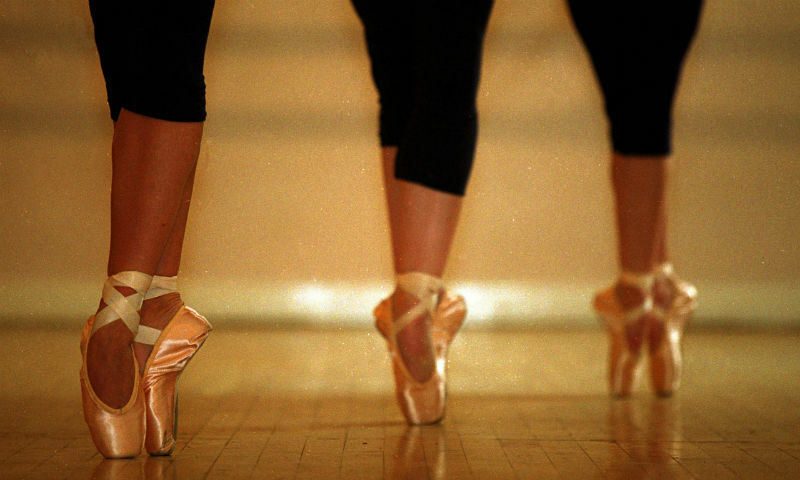 I feel very bad for the 13 year old me who would have been horrified by her older self’s abhorrence of physical activity so, I’ve decided to return to the hobby that kept me in shape for eight years – ballet. I went to my first class last weekend and boy was I shocked. I was terrible! Remembering steps, trying not to balance or grimace at the pain while still emulating elegance is no mean feat and I have to say I did not pull it off. That’s why I’m determined to keep it up, at least until I touch my knees with my head again. Easy…peasy? But enough about toil and torture, what the hell am I supposed to wear? When I started ballet classes at the age of 5 I was kitted out with pink tights, a leotard and proper ballet slippers from day one because there was no question that I wasn’t going see the term through. However, it’s harder to commit to anything when you’re a grown person, what with work and a social life. Because I was just trying the class out last week I wore horrible old leggings, a baggy t-shirt and horror of horrors, socks. Whenever new girls joined our ballet class as youngsters we would meanly snigger at those in socks. Don’t get me started on the poor things who arrived in swimming togs. Anyway, I’m sure you won’t be surprised that in order to feel fully comfortable with anything I have to be dressed the part. Now, I don’t want to go all Elle Woods in Legally Blonde on it and begin sporting what I think a ballerina would wear in class but I don’t want to look like the ugly duckling either. What. A. Conundrum. An obvious piece of advice for people in my situation is to do what the others do most others wear tights or leggings and a leotard. The thing is, while my class-mates come in all shapes and sizes, I am probably the oldest one there (I’m not a duckling, I’m a frickin’ mutton dressed as lamb!) and in short, even though I know no one gives a damn what I turn up in, I don’t want to look in one of the many, many mirrors and want to look away. Because there’s no hiding in that room, nope; no one can avoid their reflection and so everyone becomes spotlit, at centre stage in their own little world. Leotards are a tricky one. Growing up, I convinced myself that my body was too short for the rest of me and leotards were the best (i.e. worst) garment to demonstrate that fact, so it’s a pity that they are simply the best things to wear for dance class. I wouldn’t go wrapping a little skirt thing around me either, for I feel that’s like someone wrapping a transparent sarong around their other-wise bikini-clad body on the beach – fooling no one. Here’s the funny part, While pondering my sartorial predicament today, while writing this very piece, I took a break and caught a glimpse of myself in my bedroom mirror. Today I’m wearing high-waisted skinny jeans with a skin-tight lycra top tucked into it – you couldn’t get closer to the leotard look without actually wearing one. What a silly billy I’ve been all along. And how lucky am I that the short bodied look is back in fashion? For my second class tomorrow I’m trying out those same old leggings (I’ll buy new ones at the weekend, I promise) but I’ll wear a body suit with it. And a loose top over that, I have the power to not jump in the deep end. Baby steps. Style Icons: Debbie Does Daywear!